Birmingham, England lays claim to being the birthplace of balti food and no one seems to be arguing. Unique "one-pot" balti dishes are very popular around the UK, but the best place to sample and learn about balti is where it all began. This style of cooking arrived in Birmingham in the mid-1970s, created by the city's large Pakistani and Kashmiri population. Today, in the multi-cultural area known as The Balti Triangle, Birmingham boasts at least 100 balti restaurants either specializing in this food or serving balti dishes on a mixed, Indian and balti menu. Even the Chinese takeaways in the Balti Triangle dish up a few balti inspired dishes. So what is Balti food anyway. Well, for starters, its flavors may be sophisticated and complex but you don't have to dress up for "fine dining" . 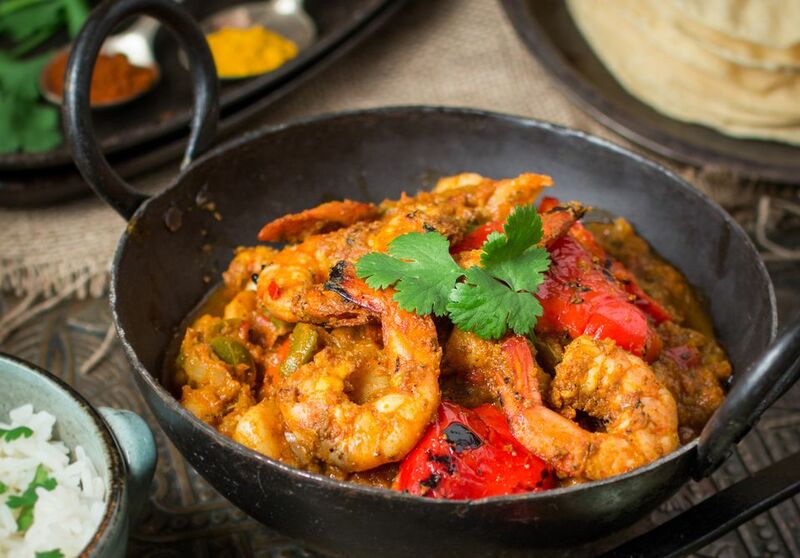 Restaurants in the Balti Triangle are small, friendly, family owned places with an informal atmosphere where you can relax to learn about and enjoy Balti food. Not very long ago, we visited the Balti Triangle with an expert guide. Andy Munro, keen fan of this style of cooking we were introduced to through Marketing Birmingham. At Al Frash, regularly named one of the top balti and Indian restaurants in the whole of Great Britain, he led us through the mysteries of the balti menu and explained a bit about this style of dining. Balti is adapted from a Pakistani style of cooking. The word balti means "bucket" in Punjabi and describes the small, flat-bottomed, two-handled wok, in which the food is both cooked and served. This subcontinental "one-pot" meal probably arose from nomadic and tribal lifestyles of the past. Balti involves the fast cooking of marinated meat and spices over a high flame. Vegetables, such as spinach, potato, mushroom or aubergine (eggplant) may be added to chicken, beef, fish or prawns. Vegetarian baltis are also prepared. The cooking and serving method ensures that the flavors of all the spices are retained and arrive at the table still distinct and vibrant. A look at a Birmingham balti menu can be a bit confusing for a first timer - it looks just like an Indian menu with its selection of dansak, korma and dopiaza dishes. The main difference, according to Munro, is that balti dishes have very little sauce compared to Indian dishes. "There is no such thing as a balti sauce," he said, unequivocally. "You cannot add a sauce to a dish and call it a balti." Most Birmingham balti houses are Muslim-owned and don't have liquor licences so there are no bars and you'll be offered a choice of fruit juices or soft drinks. Most owners don't mind if you bring your own alcoholic drinks but it's a good idea to ask ahead of time. If you can bring along your own alcoholic drink, choose beer. It's a great partner for balti food. Starters are no different from what you might find in any Indian restaurant - samosas, pakoras, kebabs and so forth. We started with mushroom pakoras - spiced and battered, deep fried morsels. Main courses arrived sizzling hot in the balti dishes and were notable for the lack of sauce or liquid associated with most kinds of curries. Mine, a chicken and spinach balti, was large chunks of spicy chicken adorned with nothing but soft spinach and some nearly melted onions. Forget forks - Well, if you must, a fork and knife will be provided. But the traditional way to eat a Balti is to scoop it up with naan, the large, flat bread, similar but richer than a pita. Our guide suggested either garlic or peshwari naan, a flat bread stuffed with almonds and sultanas (golden raisins) and lightly honey glazed. It was a perfect foil for the spicy food. Desserts are not important - but you can finish with a milky or fried Indian sweet. How hot is it? - As with Indian restaurants, you can request a mild, medium or hot balti. Because of the fresh and fast method of balti cooking, spices do retain their distinctive characters. If you are not used to the spicy food of the Indian subcontinent, you may find even the mild versions hot.Eat lots of naan and have some water or rice handy and you'll find that the food warms rather than burns. And how much does it cost? - One of the best things about eating in a Birmingham balti house is that you can dine at one of the best places in town for what passes in the UK for next to nothing. A very filling two-course meal, with all the trimmings, cost (in 2018) less than £20. Shababs , 163 - 165 Ladypool Road has an enormous menu with 24 balti chicken dishes alone. The chicken with spinach is a local favorite. Shahi Nan Kabab, 353 Stratford Rd, Sparkhill is an old fashioned, basic, eat in or takeaway kabab and balti house. Food tends to be on the hotter side. The chef used to cook for the Pakistani Navy, apparently.